How do you choose which applicants are invited to the High Achievers Scheme? The High Achievers Scheme is by invitation only; you will receive a letter from the Head of School giving you the opportunity to secure an unconditional offer if you are eligible. I have received an invite to the High Achievers Scheme, how do I accept my unconditional offer? You will have received an unconditional offer which will be shown on UCAS Track where you are able to make it your firm choice. An unconditional offer is a sign of our commitment to you and we ask you to commit to the University of Plymouth in return. We believe it is important for you to receive all your UCAS offers in order to make an informed decision on the best university and course for you. The only deadlines, therefore, are the standard UCAS deadline to make your first and second choices which is 4 May 2017. An unconditional offer is exactly that, unconditional, so you will still have your place on the course. However, you will have been selected for the High Achievers Scheme because of your outstanding application and commitment to your studies. We hope that the unconditional offer will reduce some of the worries for you in what it a stressful time, and allow you to concentrate on your studies. Can I change my course or defer my place after I am made an unconditional offer through High Achievers Scheme? You can change your chosen course to humanities subjects in the School of Humanities and Performing Arts course and stay within the scheme but if transferring to a course outside the humanities subjects in the School of Humanities and Performing Arts your unconditional offer will not be guaranteed. No, unfortunately, you will not be able to defer your application. Do I have to accept the invitation to join the High Achievers Scheme? 1. Only UK and EU applicants to full-time undergraduate degree courses within the Faculty of Arts and Humanities will be considered for this scheme. International status applicants/students will not be considered. 2. Applications are considered based on UCAS application data, including academic criteria being met and the individuals personal statement. 4. Applicants with any other outstanding conditions, for example proof of English language or mathematics, will not be considered for this scheme. 5. Applicants must choose Plymouth University as their first choice by 3 May 2018 in order to be eligible to receive an unconditional offer. 6. Feedback is only available on request, and is at the discretion of the Faculty of Arts and Humanities Marketing, Recruitment and Admissions Team. 7. An unconditional offer decision is final, Plymouth University will honour the offer of a place to any applicants successful in this scheme. The High Achievers Scheme is open from September 2019 to students who have applied to study from September 2019 on our degrees in English, English and Creative Writing, History, Art History, Music, Anthropology, and all combined degrees in these subject areas. The School of Humanities and Performing Arts is a dynamic and highly successful School of internationally renowned researchers and outstanding teachers, as recognised in national audits of our departments. Our students are very active and successful not only in their academic studies but across a range of extra-curricular activities, arts events, and internships here and abroad in Europe and the US. We know that our students represent the future of our subjects. We would like to foster your academic potential too through our high achievers' scheme, which is designed to demonstrate our belief in your potential to be an excellent University student. If you are a high-achieving student, have an interesting personal statement as well as being predicted good grades, then you are eligible for the scheme. 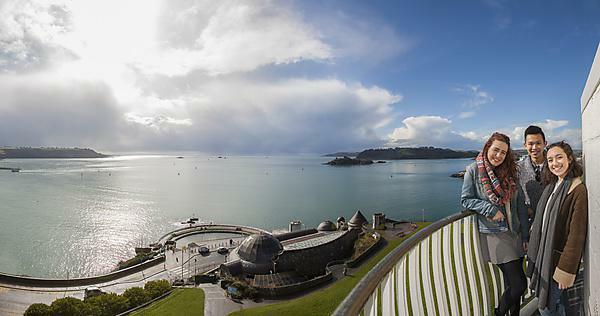 If we think you qualify for our scheme, then we will reward your potential by making you an unconditional offer if you decide you would like to make our degree at the University of Plymouth your firm choice. Once you make this choice on UCAS Track, then your unconditional offer will be confirmed by the University's Admissions office. You can then proceed to make arrangements for your accommodation and move to Plymouth in September. You can also make early contact with your Head of Department so that you can learn more about what you will be studying on your degree, receive your reading lists for the new academic year, and invitations to our public lectures and events. When you graduate from Plymouth you become part of a thriving alumni community making a difference across the world.